This is Jake, Dave's son. 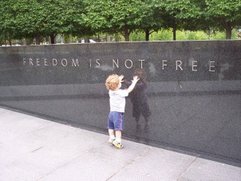 Oh, he sure knows that Freedom is Not Free. Five years. It doesn't seem possible that five years have passed since Dave was killed by a roadside IED in Iraq. I met Dave in 1995 through Ben. He was a single soldier and we often had the single soldiers over for dinner or other social activities. They all got along together very well. The unit they were in had a wonderful group of officers and they were very close. I knew him for 11 years. It doesn't seem to be have been nearly enough. For most of my life, I've always wanted an older brother. I always felt an older brother would take care of me. Dave fit that perfectly. He was like an older brother. He teased me. He took care of me. He was my friend. Five years. I don't think I can bear it when we reach more years gone than I knew him. I just don't. And, I want to feel badly that this post is all about how much I miss him, but I can't seem to. Please remember all who lost their lives in the defense of this great country especially my dear friends, Major David G Taylor, Jr. and Major Edward J Murphy. And, please pray for the families left behind. This image was the last that Michelle saw of her husband. He was returning to Iraq after his R&R where he was present for the birth of his son, Jake. Jake and Michelle Taylor live in Florida, a close drive to Orlando. We were able to see both of them twice. Jake looks like both his mother and father, but his facial expressions are pure Dave. Oh, my goodness, what a piercing in the heart. Thank you Michelle, for coming out to spend time with us. Jake's quite a wonderful little guy. In the midst of relaxing and having fun, let's not forget all who gave their lives for this great country of ours. These husbands, wives, mothers, fathers, sisters, brothers and friends. I will especially be praying for Major David G. Taylor and Major Edward Murphy and their families. I miss you. This picture is so poignant. Jake knows all too well that Freedom is Not Free. Please remember and pray for his father, Major David G. Taylor, Jr. and all the fallen service members today. My cousin was visiting from Korea. We had spent the past few weeks getting acquainted after a great trip to Niagara Falls. It was our last dinner together--she had an early flight the next morning. The phone rang. It was Ben. I knew immediately that something was wrong. The timing was off--at 6:30pm, it was 3:30am in Iraq. I didn't even say hello. I just asked what was wrong. He said, "Dave died." I yelled, "DAVE TAYLOR?". It was. I remember the tears. I remember hearing my mom crying for him--he was a favorite of hers. I remember continuing to cry as I asked Ben questions. Did he suffer? Was it an IED? What happened? Does Michelle know? What are they going to do? I didn't really expect answers. I did, though, desperately want to know that he did not suffer. I hope he didn't. I remember my Honey rubbing my arms in comfort. I remember the silence of all the children (my four and my two nephews). That night is burned into my brain. Every little detail. Michelle called me that night. She was very strong even in her grief. All I could think was that Jake was robbed of his father. One year ago today, Major David Gladney Taylor, Jr. was killed by an IED while serving in Iraq. He had two weeks left before his tour would've been over. Dave with Honey (2003). He loved her from the moment he picked her up in the hospital. There was no hesitation with holding a newborn for him. We all miss him and my heart has not stopped aching. I had heard this song by Tim McGraw (I think the official title is Already Home) a couple of weeks ago and bawled like a baby on the way home from the grocery store. The line that really got me was about the baby he would never know. I had heard that after Tim McGraw had performed this at the ACM Awards that the back of the stage lit up on families of the fallen. I wanted to see it and so I finally googled it today. As expected, I cried. It felt like a piercing in my heart--the same way I've been feeling when I think of Dave. After watching the video I went downstairs (Ben had left the room--he can't listen to this song at all for it hurts his heart). Ben asked if I cried. Then he said I like to cry. I couldn't quite deny it, but then his next statement made me pause. He said it was cathartic for me. Yes, it is. I then said, "I didn't get to cry enough when he died so once in a while I need to." And it's true. I didn't. I couldn't. I wanted to so desperately. And, I did sometimes, in the night, but I had to go on and be strong for my little ones. That night I found out about Dave, my children were stunned into silence. My nephews as well. It's indeliby imprinted into their minds as it is in mine. It scared them to see me so vulnerable. It was the first time they'd seen me cry and with such grief. I feel that grief almost as strongly today, but I know it will eventually get better. I can't get that image of him sitting in the mangled humvee as the medic worked on him. I just can't. I can only pray he didn't suffer. And, I will only say that sometimes ignorance is bliss. Today is your birthday. Do you celebrate where you are? I wonder what you would have been doing on this day. I imagine that Jake would've woken you up today with much love and that you would not begrudge him that even though you love to sleep in. 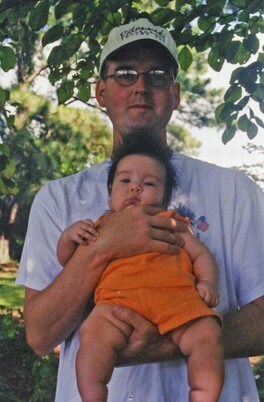 I know you would've made a great father. You used to have so much fun with my children. Remember when Honey was born? You came to visit us in the hospital and held her with no qualms. Remember when Honey was making you laugh and laugh so you inadvertantly ignored Sister? She was so mad at you in the way only girls could be. It took you weeks to win her over again. Sister made you work hard for her didn't she? You finally did win her over but then we moved away from you and Michelle.